So, not a whole lot of fishing going on. Been really hot locally, was out of the area for 3 days traveling for work (thanks for having the earthquake before my plane landed L.A.! ), and just been plain busy. That being said, a few fishing related things happened, so I'll list em now. Fishing Thing #1. K.C. & I took Lilly to the Kimberton Fair last weekend. Lilly loved all of the rides, especially the cars that went round and round and round and round. Lilly definitely inherited her Mom & Dad's love of amusement parks, we had to pry her off the rides! Anyway, we did play a few carnival games too, and Lilly caught a HUGE rubber shark in the "fishing" game. She walked away with a pink squishy ball for her efforts - now when do we go to Disney World? 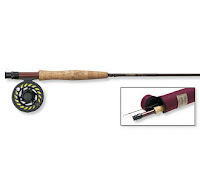 Bought a Fly Rod from L.L. Bean. Fishing Thing #3. 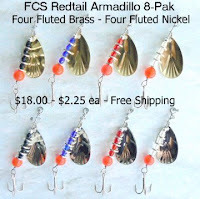 John Delaney from Fish Creek Spinners sent over an 8-pack of his Redtail Armadillo Spinners to try and pass out to a lucky few. I have to say, John has outdone himself. As usual, they are of superior craftsmanship. Sounds like things are picking up for Fish Creek Spinners as well in Colorado. His products recently received a write up in the Colorado Department of Wildlife Fishing Report and his lures are selling briskly locally. Good stuff John!